A character not in Gatchaman, Zark was added by Sandy Frank to pad episodes of Battle of the Planets due to the amount of material that was cut. 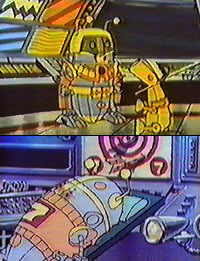 He looks much like R2-D2, possibly to cash in on the Star Wars craze at that time. Over time, he eventually gained the ability to "fly" by flapping his cape (though why he had to fly two feet to the other side of his monitoring station is beyond me). He spent much of his time cleaning the deep-space monitors (next time, buy a cleaner that doesn't streak!). 1-Rover-1 is 7-Zark-7's canine companion. It learned to fly by twirling his "tail" in a helicopter-like manner. The above description came from a site that no longer exists, and was edited by yours truly (contact me).